The North-South Ministerial Conference (NSMC) was set up to bring Northern Ireland Executive and Irish government to oversee the work of six cross-border implementation bodies. The12 British-Irish Inter-Government Conference was established to promote bilaterial cooperation between the UK and Ireland. This replaced the Anglo-Irish Inter-Government Council.13 The three strands of Northern Ireland Assembly, North-South Ministerial Conference, and British-Irish Inter-Government Conference are inter-connected to provide checks and balances between the groups. A new era was about to start in Ireland as the following quote from the newspaper states. This monument is called "reaching across the divide" which symbolizes cooperation of Republican and Loyalist communities in aspiration for peace. The individuals and different organizations that helped establish the Good Friday Agreement have shared their beliefs and emotions with both sides. 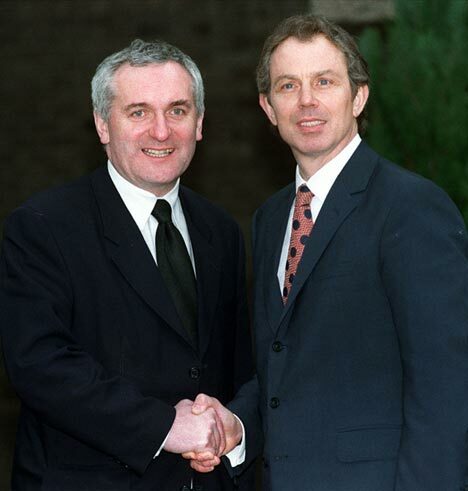 It took courage on both sides in order to work on a peace process to end the years of violence and come to an agreement. The people of Ireland are at the stage of forgiveness and trying to move into the promising future. Ireland has also had tolerance for ambiguity, which is the ability to live with situations that are unclear.24 The future of Ireland is unknown. The Good Friday Agreement was a turning point for the people of Ireland but there are many obstacles that still need to be faced in order to put the pieces of Ireland back together. Although the Good Friday Agreement has helped lessen the conflict in many ways, it has helped many avoid dealing with the past history of Ireland. Many are looking forward to the future and never want to return to the violent past. The people of Ireland may not be ready for the truth of what many political parties were responsible for. This could bring back painful memories, or increase hostility once new information is gained. Northern Ireland is ready for peace, reconciliation, and unity.